Where Can I Find UP Certified Olive Oil? To ensure the highest standards are consistently being met and maintained, a comprehensive testing and compliance program has been developed for UP. From mill to bottle, these testing and compliance procedures mandate traceability and accountability in order to deliver the high standard of UP quality to the end customer. To achieve the highest standard in the olive oil industry, we use services of the most proficient olive oil lab by the American Oil Chemists Society standards. Modern Olives Laboratory Services-Claudia Guillaume has been awarded First Place in the “Analytical work for the Determination of Olive Oil Part B” by the AOCS (American Oil Chemists' Society). The AOCS runs the world’s most extensive and respected collaborative proficiency testing program for oil and fat related commodities, oilseeds, oilseed meals, and edible fats. More than 500 chemists participate to verify their lab’s quality control. 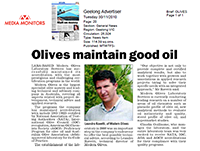 Modern Olives Technical Director Leandro Ravetti comments “Receiving recognition for the accuracy of our laboratory proficiency program by the most prestigious oil society in the world and a highly independent body is a great honour for our lab and for Australia”. “It reinforces the fact that our scientists, knowledge and research in olive oil chemistry are of the highest standards”. “Furthermore, USA is Australia’s main export market for olive oil and having such recognition from an American body is a great boost in confidence for our laboratory and our customers in Australia that export their oils over there”. Modern Olives is the leading advisory company to the Australian olive industry, covering all aspects related with project development, technical advice and applied research. This win acknowledges that Modern Olives is a state of the art laboratory, offering award winning technical advice to companies here in Australian and overseas.